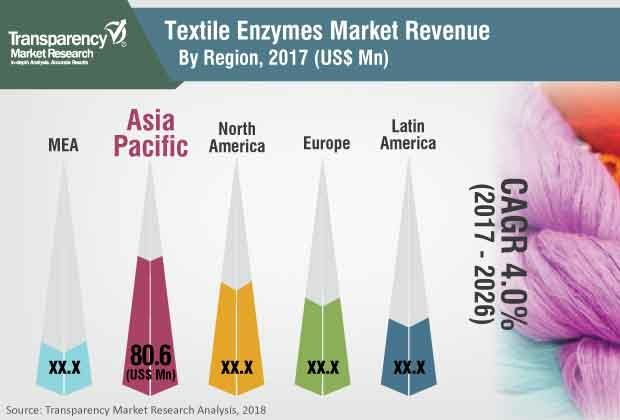 The global textile enzymes market was valued at US$ 201.5 Mn in 2017 and is projected to expand at a CAGR of 4.0% from 2018 to 2026, according to a new report published by Transparency Market Research (TMR) titled ‘Textile Enzymes Market – Global Industry Analysis, Size, Share, Growth, Trends, and Forecast, 2017–2025.’ The report indicates that growth in clothing and fashion industries is likely to augment the demand for textile enzymes from 2018 to 2026. Key players are expanding their footprint in the textile market in Asia Pacific. Thus, these players are anticipated to account for major share of the global textile enzymes market during the forecast period. Increase in disposable income and changing lifestyle of people in emerging markets such as China and India are projected to boost the market in Asia Pacific from 2018 to 2026. The textile enzymes market is primarily driven by the rise in demand for non-toxic and eco-friendly enzymes and increase in need to lower pollution in the production of textiles. Additionally, changing lifestyles and increase in disposable income of people are propelling the demand for products containing textile enzymes. However, intense competition among raw material suppliers of textile enzymes along with high cost are restraining the global textile enzymes market. Textile enzyme can be used as a direct substitute for synthetic chemicals. This offers immense opportunities to the global textile market. The report offers detailed segmentation of the global textile enzymes market. The market has been segmented based on type and application. In terms of type, the market has been classified into cellulase, amylase, catalase, pectinase, laccase, and others. Cellulase held the major share of the market in 2017 primarily due to the increase in demand for smoother and glossier appearance of fabrics. In terms of consumption, amylase enzyme followed cellulase enzyme due to the rise in demand for desizing of denims and other apparels in the clothing industry. Based on application, the bio-polishing segment is projected to hold dominant share of the global textile enzymes market during the forecast period. Significant potential of the denim clothing sector and advancements in textile manufacturing provide new growth opportunities to players operating in the textile enzymes market. In terms of revenue, the bio-polishing segment accounted for major share of the market in 2017 owing to increase in demand for enhanced processing and energy saving methods. Bio-polishing also enhances the final product in terms of quality and appearance. In terms of value, Asia Pacific held the prominent share of the global textile enzymes market in 2017 due to the increase in industrial output from the textile industry. Furthermore, Asia Pacific was a rapidly growing region of the textile enzymes market in 2017. Rise in investment in the textile industry in China and India is estimated to boost the textile enzymes market. Rapid industrialization and changing behavioral patterns among consumers are the key factors boosting the market in Asia Pacific. China is the leading manufacturer and consumer of textile enzymes in Asia Pacific. Increase in concerns about wastewater management is estimated to boost the demand for these enzymes in countries in Asia. The textile enzymes market in Europe is expanding at a significant pace due to the implementation of stringent regulations on the usage of chemicals in the production of textiles. Similarly, the market in Middle East & Africa and Latin America is expected to expand substantially during the forecast period. The report also provides profiles of leading players operating in the global textile enzymes market. These include AB Enzymes GmbH, Zytex (India) Pvt. Ltd., Refnol Resins & Chemicals Ltd, Sunson Industry Group Co., Ltd., Lumis, Maps Enzymes Ltd., and Genotek Biochem. Expansion of portfolio of textile enzymes through improvement in existing products and development of new products with enhanced features is one of the key strategies adopted by several key players.